You know, there are these things in life that are so simple, you think they’d be impossible to mess up. Like using a faucet. Or drinking a glass of wine. But, every now and then, we must stand corrected as we realize some of these things aren’t as straightforward as they seem. How to wear earbuds for example. Just insert them and that’s it, right? Wrong. 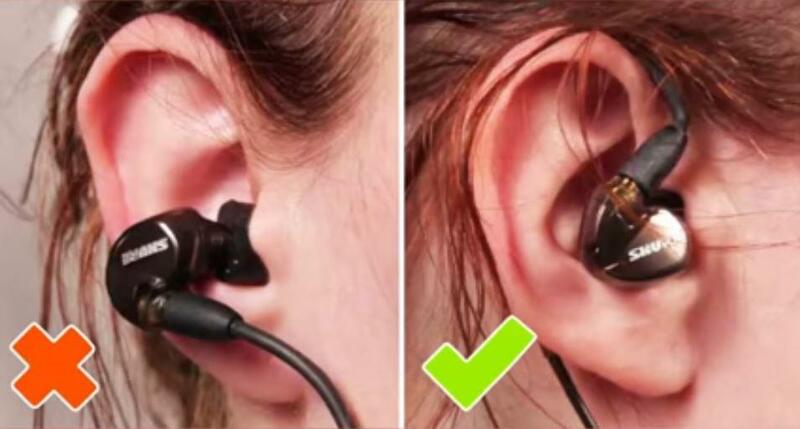 Though this ‘direct insertion’ method is by far the most popular one, it does lead to one of the most common wearability-associated problems with earbuds. You’ve probably experienced it yourself already: They fall out all the time, and even when they don’t, you’ll be forced to constantly readjust them. What a pain it can be to wear earbuds like that, don’t you think? Well, fortunately, there is a method that does away with all of these issues. Want to know what it is? Read on, young grasshopper, and you shall see. Now, before we get started, let’s look at this first simple, but highly important step. If you get it wrong, you can blame yourself for your uncomfortable earbuds. And oh boy, do many people get it wrong. Basically, look at your earbuds. No matter the manufacturer, brand or model, they should have some sort of marking on either end, usually ‘L’ or ‘R’. ‘L’ being short for ‘Left’ and ‘R’ for ‘Right’, obviously. There are few earbuds out there that don’t feature markings like these. In that case, you can wear either speaker on any side, whichever you want. Always start with one side to put on, the left for example. Gently push it towards your ear canal, but don’t force it in. It should now rest comfortably in the outer part of your ear hole, with the speaker hanging around the crevice of your ear. Remember, most earbuds are not designed to be completely inserted into the ear canal, in spite of their looks. The plastic connecting the speaker and audio cable should roughly line up with your jaw. Simply repeat what you’ve already done with the left earbud on the right side. Try to mirror the action as closely as possible, but remember that our ears are not quite the same! An asymmetric fit might not be down to the earbuds themselves or even an improper assembly, but rather your own anatomy. As long as both earbuds ‘sit’ properly and snugly, the speakers just touching the ear holes, everything should be fine. Now, this step is one of the few that people either get wrong or simply ignore most of the time. You see, the number one problem with earbuds is them falling out at the most inconvenient moments. We’ve already established that. However, what we didn’t concern ourselves with up until this point is the fact that earbud manufacturers are well aware of this deficiency, and have crafted add-ons and various accessories to remedy it. The most common kind are so-called ‘wings’, which are small plastic pieces that connect to your earbuds and fit right into the upper curve of your ear, holding them in place through friction. They may look weird, but accessories like these are a must if you really want to wear your earbuds for long periods of time on end without any comfort or wearability issues. But just wearing your earbuds as described in steps 3 and 4 is not the only option! For an even tighter fit, with or without wings, you can do the following: Take your buds’ audio cable, the end that connects to the speaker, that is, and wrap it around your left ear, guiding it around the helix, the thick, bony rim on the outside of the ear. Note that the cable shouldn’t touch the actual surface of your ear, but go around it! After you’re done, the speaker should arrive on the other end hanging upside down and roughly at the same height as your ear hole. Next, just insert the earbud as described above and mirror the process on the right-hand side. It doesn’t really matter if the other end of the cable goes behind your back or down your neck, so experiment and find the way it suits you best! And at last, consider these boring, albeit highly important safety warnings. For your own well-being, remember? Never, ever wear earbuds while you’re driving. Apart from getting distracted and possibly causing an accident, it is illegal in most countries to do so, even if you’re not actually listening to any kind of music. Always exercise caution when wearing earbuds during exercise, or when jogging, running etc. They could fall out at the most inconvenient moments (if you’ve not followed our guide, that is), and you don’t want to cause a large commotion when they do. Don’t crank the volume up too high. Most earbuds, like their larger siblings, headphones, are not designed to be used at full volume for any realistic amount of time. If you do, it could result in permanent damage to your ears. See Best PS4 Headset, Best Bluetooth Headphones & Best Earbuds Under 100. So, you think you’ve mastered the art of wearing your earbuds properly? Why don’t you try it out right now? You could tell your friends about your newly-acquired skills; We’re sure they’d be in awe. And don’t forget: Stay safe while you’re at it!